Hello again, welcome to 2019! This month’s topic may seem unusual coming from the financial guy but bear with me. True, professional, financial advisors don’t stop at investing. There are many factors that impact our financial lives. As we get older, there is a huge issue that can seriously impact us financially. 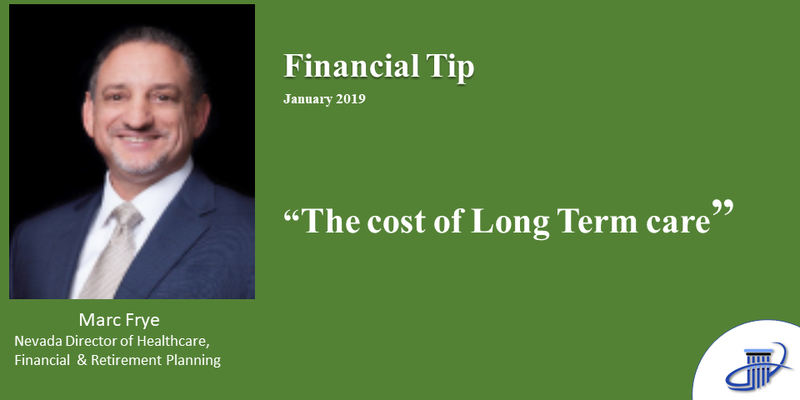 I’m talking about paying for the costs of long-term care. I know, you’re never going to a nursing home. I’ve heard that a million times over my 30-year career. I wish I could say that my clients were correct in their assertion. But, unfortunately, that’s not the case for some. Long-term Care (or LTC) is not just a nursing home. It can be a nursing home, assisted living facilities, and/or home health care. Some plans will even pay a family member to take care of you. This type of care is not covered by Medicare, Medicare Supplements, or Medicare Advantage Plans. Care can run as much as $80,000 dollars or more annually, depending on where you live and the type of care that you need. The risk to your portfolio is bad enough that we advise our clients with even a modicum of assets, to protect those assets in some fashion. We can use Long-term Care insurance policies for that protection. We custom design a plan to fit the individual client needs, and then shop it with all companies to find the most appropriate coverage and at the lowest premium. Sometimes we can build the protection right into the financial plan, using investments that provide extra income for long-term care confinement. Some of our clients opt to use a combination of insurance and savings to do what we call Medicaid planning. We basically custom design a plan to protect assets as we reposition them to prepare for Medicaid qualification. So, in short, even if you think you will remain home with only family taking care of you, it’s a good idea to cover your bases in some way. Be prepared. We are here for you and are happy to assist you in exploring your options. Stay warm, stay safe.